Let's put this on the table right now: I don't believe the practice of law should be equated with a business whose sole purpose, in b-school parlance, is to produce a profit. The rule of law is more than a theoretical concept and there is a clear and undeniable need for increased access to justice worldwide. That said, the business operations of law practice can be improved and the profession can pursue both its noble mission to enrich humanity while simultaneously turning a profit. A handsome profit, I might add. Let's also acknowledge that large law firms are, by any standard, already very profitable enterprises. In my many years of coaching salespeople catering to law firms, one challenge we've encountered time and again is partner motivation. We've written here about law firms' reluctance to drive change unless forced to by the clients. There's also an innate conservatism which hinders any disruption to the status quo, let alone bold change. As one salesperson put it, "The partner can't seem to muster up the energy to push for the adoption of my recommendations, probably because he earns $2 million today and the new approach will take him to $2.5 million, but that payoff isn't worth the headache." Indeed, during a stint at a global law firm I observed to the chairman that eliminating the colossal and unnecessary waste I observed in my first 3 months on the job alone could easily generate a double digit annualized increase in profit margin. That's an astounding statement, whether or not you back it up with the math, as I did. Trouble is, most law firm leaders view this statement in terms of discretionary expenses. And we had these -- including the many tens of thousands of dollars hastily spent by one partner mere weeks before the bi-annual partner conference to create large tapestries of bridges representing each country where the firm had an office (around 35 as I recall), with the implication that partners would see these draped about the Waldorf ballroom and feel more inclined toward cooperation and teamwork. In another example, a practice chair required all handouts at his monthly meetings to be printed in full color and bound, though not once when I was in attendance did a speaker refer to the materials and most often these were left behind on the table or in the conference room garbage bin. But there was far larger waste through process inefficiency. I was asked to provide input into a new conflicts checking system, though the input was limited to suggesting better questions to ask at new matter intake. A quick chat with the very competent conflicts team revealed that the firm ran the same conflict check on the same clients multiple times every year, year after year, sometimes hundreds of times over the course of several months. Furthermore, there was no coordination between the conflicts system and the strategic planning process, so the team ran countless conflicts checks for client targets that had already been deemed unsuitable, and the practices continued to pursue client targets that had already been conflicted out. The firm had no understanding of the cost of this inefficiency, no latitude for the staff to address such issues without partner oversight, and no interest by any partner to wade hip-deep into operational issues such as this. But it's not just about databases and back-office technology; there is similar inefficiency in the practice as well. Not so long ago it was a badge of honor for a large law firm to recruit numerous associates, regardless of current market demand, and rotate them around the firm, encouraging them to re-learn items commonly known to other lawyers, and billing clients for this training. Every firm talks about cross-selling but few have embraced the DNA-altering approach that values -- and compensates -- team or firm performance over individual contributions. Many firms have launched client teams, but few clients would readily agree that team members know their business at any significant depth, and even fewer would characterize their outside counsel as trusted business advisers. Fundamentally altering the firm's recruiting strategy? Establishing true associate training and apprenticeship? Re-designing compensation systems to drive collaborative behavior? Which Biglaw partner wants to raise his hand and dive deeply into these issues? Who wants to look at his colleague and say, "No, you may not unilaterally decide on behalf of all of us that expensive pictures of bridges will foster teamwork,"
It's unlikely that your average private equity investor has the know-how of law firm operations to solve this sort of thing either. However, any investor accustomed to shepherding his capital will want eyes and ears on the ground, and these challenges -- nay, opportunities -- will quickly come to light. If a PE firm purchases a significant stake in a large law firm, rest assured that the investor representative they install on the management committee, whether this is a COO, CFO or some derivation, will be able to do the math justifying why process improvement will lead to substantially better returns -- for the investors, for the partners and, oh yes, for the clients. This isn't rocket science, and cost containment programs based on ROI, investments based on NPV and even formal business process improvement programs like Lean Six Sigma are really not much more than common sense ideas backed up by math and a governance structure which places the good of the firm above the desires of individuals. Color me crazy (you wouldn't be the first!) but some of us enjoy surveying the paved cow paths, identifying where new approaches can shorten the time from A to B, removing obstacles and impediments that serve no purpose, demonstrating through simple math that speed, quality, profit and client satisfaction are not opposing objectives. Of course it will be hard. But the PE investors who truly want to unlock the value embedded in Biglaw will understand the potential return on delving into the tough issues. At the other end isn't necessarily a "corporate law firm" where partners are senior executives taking paychecks from absentee investors. Nor does a new and improved law firm have to eliminate all profit-dilutive practices and "fire" longtime clients that no longer generate significant revenues. However, these will be conscious choices made in the full light of day. 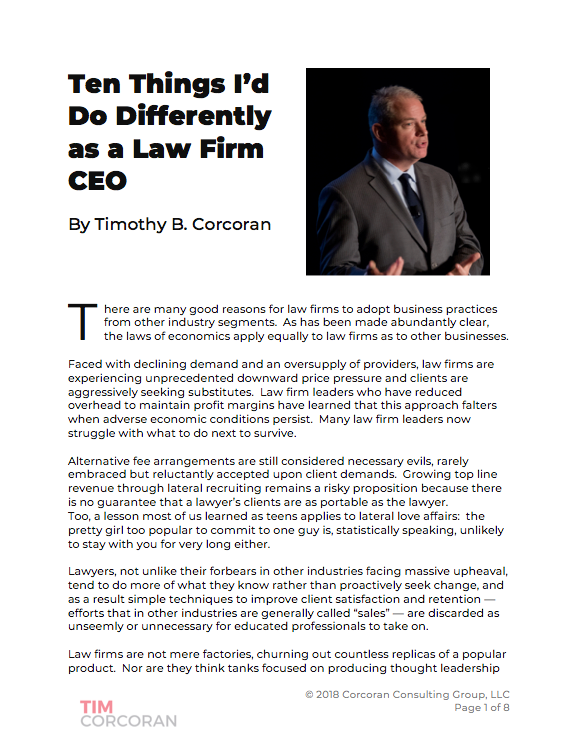 A well-run law firm differentiates between its premium and commodity practices, lowering rates in some and expecting (and realizing!) higher rates in others where true, demonstrable expertise can be quantified. Pundits say that associates and partners alike have lost the "quality of life" battle and clients are losing the diversity battle, as cost trumps all other concerns. But imagine a law firm that clearly understands how to derive profits and client satisfaction from lawyers with more flexible schedules, or how to supervise work outsourced to others in order to address client concerns over cost and diversity and quality. The fun part comes once the first couple of firms are pushed in this direction. Others will see that it doesn't require a private equity investment, which carries with it an obvious cost, to derive similar returns from process improvement. The tools are available today, the people who can manage the process, run the numbers and hold the partners' hands are out there already. Some are in law firms, many are not. But given the right precedent to show the way, I'm prepared to believe that a strong law firm leader can take on such an initiative without the offsetting dilution of a private equity investment. This calls to mind the movie Die Harder, in which airport hijackers turn off the runway lights and sever all electronics, keeping incoming flights circling because poor weather prevents the planes from diverting to alternate destinations. As government officials work to meet the terrorists' demands, the flights circle and circle above, their fuel dropping dangerously low. When the hero finally destroys the terrorists' escape plane, leaving a trail of burning jet fuel along the runway, the ingenious pilots above use this as a beacon to guide their approach and landing. Law firm leaders, will you be the first to land? Will you be following someone else's trail? Or will you be circling endlessly, awaiting the return of familiar lights and beacons before you take the safe route home?